Anthropomorphic means having a shape like a human. Designed for both programmed and live entertainment, Anthrobots are also robustly manufactured for travel with easy set-up & dismantling with minimal maintenance. This document is to be viewed by those who are considering either a rental or purchase of the technology. It is meant to offer a greater understanding of the technology only. A formal proposal for an actual rental or purchase can be requested directly from IRI. Move a ball with your mind! Brain Ball is a custom-designed table with a playing area, a ball and two headbands. The players take positions at opposite ends of the table and wear headbands equipped with sensors (electrodes) that detect brain waves. 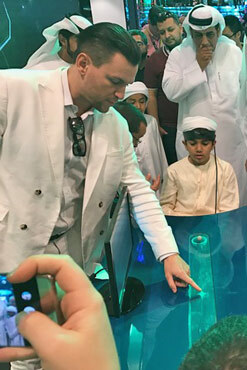 The sensors are connected to an amplifier and biosensor system built into the table, which registers the electrical activity in the brain. When a player increases its amount of Alpha and Theta brainwaves, which occur when one is calm, relaxed and focused, he or she activates a magnetic carriage embedded in the table (visible to players and audiences as a ball on the surface) towards the opponent’s goal. Contrary to most competitive games, the most relaxed person wins! 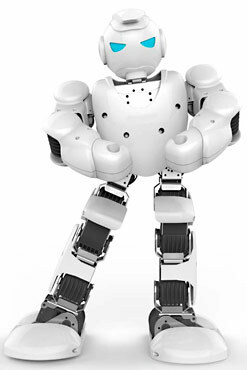 The first affordable humanoid robot designed for families and schools! MILENNIA’S LITTLE COUSIN. The Alpha 1 Robot comes pre-loaded with lots of fun animations, music, dancing and songs. Just download the APP to control through your Smart Phone! This robot is programmable with 3D Visual PC Software for schools. It has a superior high performance processor for remarkably smooth operation. Very well engineered and guaranteed fun! A FULL ONE HOUR PLAYING TIME PER CHARGE. Crowds love these! Luminglas can be made in virtually any shape. Colors include: blue, red, green, magenta, white, or a mixture of any of these. Sizes range up to 24” by 24” square, and 42” round (larger displays are possible but typically are made up of pieces tiled together). The display is powered by a low-voltage power supply that runs off of a UL-listed 12V wall transformer. The speed of motion of the display is fully adjustable and can be sound-interactive via a built-in microphone.